All tools, no matter how carefully you use them, tend to lose their sharpness, or get rusty over time. Getting them back in shape is made easier with the help of grinders. Mentioned below is a list of the top three power tools designed to meet grinding and sharpening needs. Triton tools is known for its innovative and award winning designs. Backed with decades of experience, Triton TWSS10is a quality product designed especially to meet the needs of professionals in the woodworking industry. Triton TWSS10 is a slow speed whetstone sharpener that has a premium grade 220 grit grindstone. It produces a razor sharp and perfectly polished edge on shaping and cutting tools. This whetstone sharpener is great for sharpening knives, hand tools, chisels, plane bladesand a variety of wood carving tools. It comes fitted with a high grade, pre-dressed, grindstone as well as a leather honing wheel. The fee on Triton TWSS10 are rubberized. This helps in keeping the machine stable. It also minimizes the vibration when the motor runs, improving the quality of the finish. The powerhouse of this unit is a 120 watt motor, which provides a long lasting and smooth performance. The noise output of the motor is low. 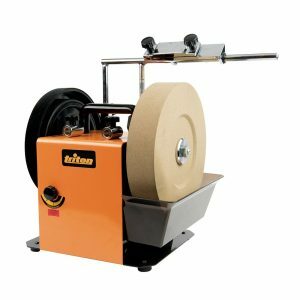 Premium grade 220 grit grindstone is easily redressed with the stone grader. The grindstone runs on slow speed. It is also water cooled at the same time as part of the wheel is submerged in the water trough. This keeps the grinding surface of the wheel cool and ensures that edges of the tools don’t get overheated or lose sharpness. Owing to decades of experience and excellently engineered design, the slow speed whetstone sharpener from Triton can withstand heavy volume tasks which are common in production shops, with as much accuracy and quality finish. The design features a vertical mount and a horizontal mount for the support arm. Large handle on the unit facilitates easy portability. Online reviewers feel the unit should also include an eye shield that also doubles up as a magnifying glass for increased accuracy. WEN has been making quality products since decades and are the preferred choice of most professionals in the wood working industry. 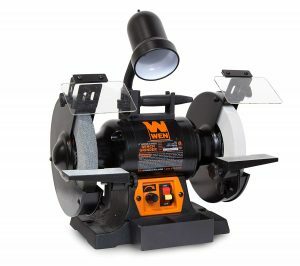 WEN 4280 bench grinder is a variable speed machine. It can shape, smoothen and sharpen wood and metal quickly. It can also deburr ragged and chipped edges as well as remove rust from metal, clean, polish and buff surfaces. Slower speed increases precision and offers greater finesse. Higher speed makes way for faster removal of excess / unwanted material. You can choose the speed you wish to run the grinder at, based on the task you are using it for. Owing to the versatility, durability and endurance of the wheels, as well as the powerful motor, WEN 4280 bench grinder is equipped to take on heavy volumes of grinding task that are a common occurrence in a production shop. This bench grinder features an eye shield corresponding to each wheel. Tool rests are flat and of a comfortable size to accommodate most tools. WEN 4280 is compact in size making it portable and also a preferred choice for small work spaces. WEN 4280 has a cast iron base. It also has a provision of mounting holes so that it can be fastened on the work surface or a pedestal stand with the help of bolts to prevent wobbling and allowing better stability. This bench grinder also features a work light so that the work area is better illuminated for greater efficiency. Users have said that they find WEN’s pedestal stand so comfortable to work with, that it should be sold as part of the unit and not separately. POWERTEC is a company with many decades of experience in the wood working machines industry. They have consistently received highest ratings on e-commerce portals such as Amazon. POWERTEC BGSS801 is a low speed bench grinder. It is designed to handle grinding tasks such as cleaning, polishing and buffing surfaces of wood and metal. The motor on this bench grinder has 1/2 HP capacity with an extremely low noise output. It delivers smooth performance and is long lasting. The wheels on POWERTEC BGSS801 bench grinder turn at 1725 revolutions per minute (RPM). 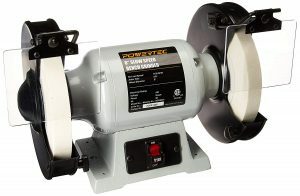 The wheels on this bench grinder are made of white aluminum oxide, which produces less heat. Width of the wheels is 1 inch, which makes way for easy grinding. Lower RPM is ideal for increasing precision and a good quality finish. Lower RPM also prevents damaged caused to the tools from exposure to overheating. POWERTEC BGSS801 features adjustable eye shields. For the price this product is offered at, it fails to take on heavy volume work. When using machines such as grinders, it is necessary to exercise caution. Not all models come with eye shields, therefore you must ensure you wear a safety helmet that properly covers your eyes from the sparks generated. It would also be a great idea to wear rubber or latex hand gloves, as they offer a good grip over the tool you wish to sharpen and also keeps your hands safe from hazards such as burns and injuries.